According to authorities, the owner of a tree cutting company died in a wood chipper accident. The Boston Herald reports that the man was attempting to clean the inside of the chipper when a three-foot long, crescent-shaped metal shield came off and went through his chest. Officers report that the man was letting two people borrow the chipper and he was showing them how to use it and clean it. The man allegedly stayed alert and conscious after the accident, but later died before a helicopter was able to transport him to a hospital. Our Boston workers’ compensation lawyers understand that tree trimming and other similar operations are common in the area to keep our landscape looking its best. It’s also a common cleanup effort after a storm. 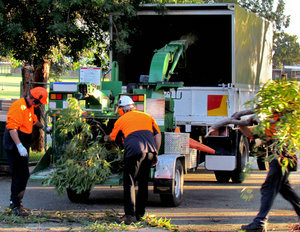 These chippers shred branches and other parts of trees and transform them into mulch. These trees are fed into a chute and are sent through a number of blades to turn them into small wood chips. Unfortunately, these chippers come with some serious risks for operators. According to the Centers for Disease Control and Prevention (CDC), operators who are injured or killed by these devices oftentimes get caught in the feed mechanism and are pulled into the rotating chipper knives or struck by the hood of the machine while it is being opened or closed with the knives still rotating. Officials with the CDC looked deeper into these scenarios and these accident reports to see just how serious of a problem this is. From 1992 to 2001, there were more than 2,000 injuries reported from people working with wood chippers. That means that there were more than 200 reported each year during the study. Of the injuries that were reported, more than 45 percent of them occurred to workers who were between the ages of 25 and 34. In roughly 60 percent of these incidents, the employee involved sustained an injury to one of their upper extremities. From 1992 through 1996, there were close to 200 amputations resulting from these accidents. In about 25 percent of these cases, the person who was injured missed more than 30 days from work as a result. Close to 20 percent of people who were injured missed less than 3 months and another 20 percent had worked 3 to 11 months. The truth of the matter is that these kinds of accidents are going to cost you — with medical bills, lost wages, recovery time and more. According to the Occupational Safety and Health Administration (OSHA), chipper safety devices are available to reduce the risk of “caught-in” or “struck-by” accidents. Some manufacturers have equipped chippers with one or more of these devices. It’s critical to make sure that your wood chipper has these devices and that you’re thoroughly trained in how to use them to help to reduce your risks of an on-the-job accident.